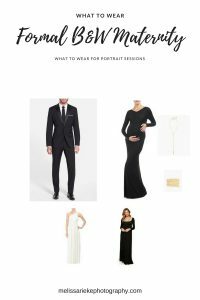 I’ve been dreaming of this what to wear for a Formal Black and White Maternity Pictures Session. Who wants to get all dressed up and show off that bump? Did you know that the best time to photograph your pregnant belly is between 32 and 34 weeks? This is a great time when you are starting to get nice and round, but you aren’t to the place where you are uncomfortable and swollen. I had so much fun with Beth when we did her Formal Maternity Session in the city! See it Here. Maternity sessions can be added on to any Newborn Session. See all the options here.